She’s played with Bowie, Stefani, Kravitz and so many more. Gail Ann Dorsey played with Lenny Kravitz at the BB&T Pavilion in Camden, New Jersey, Thursday, July 28, 2016. 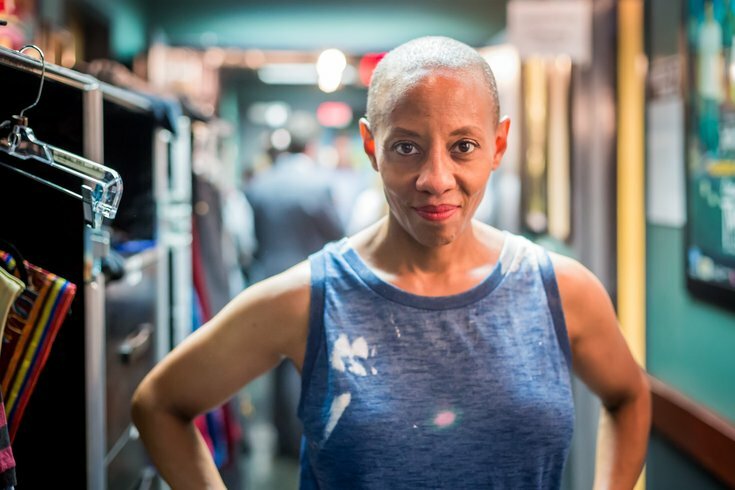 You never know where Gail Ann Dorsey is going to show up. The West Philly-born bassist and guitarist has toured and played with some of the biggest names in music — David Bowie, Tears for Fears, Gwen Stefani, Indigo Girls, Ani DiFranco — the list is crazy long. Thursday afternoon, I was delighted to see her up there as part of Lenny Kravitz’s band’s performance at the "Camden Rising" concert at BB&T Pavilion, providing thumping basslines on “Let Love Rule” and “Are You Gonna Go My Way.” Since PhillyVoice was the official media sponsor of the event, I had a backstage pass and was able to, as politely as possible, ambush Dorsey for an interview in a hallway. She graciously took some time out of packing up to talk to me. You grew up in West Philly, right? I'm from West Philly, yes — 61st, between Race and Vine. I left Philly when I was about 17. That was about, ooh, I don't even want to tell you how many years ago that was. It was 1980. Went to college. College in California, and then I went to New York and London, and I’ve been all over the place. But I haven't lived in Philly since 1980. I was born in 1962. My mother passed away about five years ago, so I don't come back that often. She was still in the house I grew up in, on 61st Street. I have a few siblings in the Jersey area, Stratford and Willingboro. Were you always a bass player? I started playing bass when I was 14, but I started on guitar when I was 9. But yeah, I was playing bass in Top 40 bands here in Philly when I was 14, 15, 16. Any names you want to mention? Oh, I wouldn't know, you know — they were local kids. We were all kids, and we played whatever was on Top 40 radio — Rolling Stones, Fleetwood Mac, all the stuff that was [on the radio] in the late ’70s. We played Sweet 16 parties and clubs and on the boats at Penn's Landing, stuff like that — in the summertime, when I was off school. And this was the heyday of Gamble & Huff. To this day, I’m proud to be from Philly because of the music that's come from here. I think it's just as relevant as Motown and all the rest of it. ... But I think, actually, what made me feel like I could get out there in the world and be a guitar player was seeing Heart. Do you remember where you saw them? I saw them at the Tower Theater. And I saw them many times in other cities over the years. I still go and see them whenever I can. And you played with Bowie for years. I played with Bowie and — I played this venue with Gwen Stefani; I did the 'Sweet Escapes' tour and the 'Love Angel Music Baby' tour as well. But we played here — I remember it was her first son's first birthday and we had a party out the back of this very venue. And I think that was the last time I was here; it was quite a few years ago now. What did you think of the crowd today? I thought it was great. It was wonderful. It's a great cause. You know, I'm a Democrat. I was raised a Democrat. I've been a fan of Hillary [Clinton] all the time that I've known her in my lifetime. And really hope she wins. I think she'll do as decent a job as anybody else. 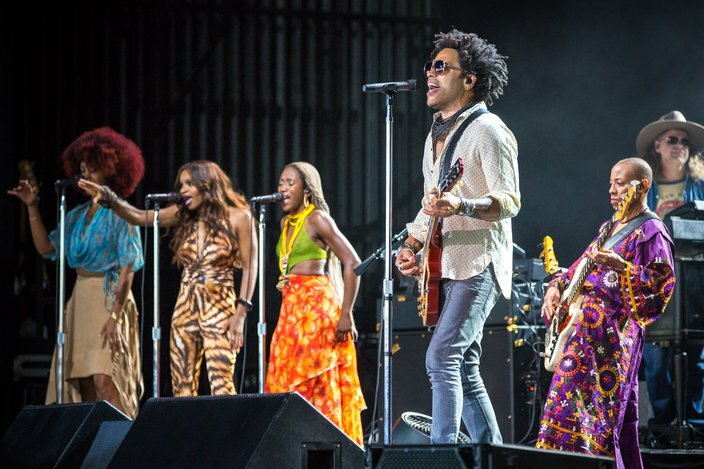 Lenny Kravitz performs at Thursday's 'Camden Rising' show at the BB&T Pavilion in Camden, New Jersey.